Vintage - Bareuther & Co. China - Starlight Pattern #BTH253 - Made in Bavaria, Germany (the US Zone) from 1945 through 1949 Only. The Bareuther Starlight Pattern #BTH253 is a lovely White Background with Pink Rose and Rose Bud, along with Green Foliage. Beautiful 22kt Gold Trim on Rims, Feet and Handles, along with 22kt Gold Leaves Hand Painted on both pieces. 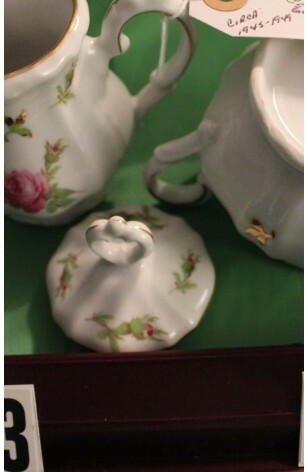 We are offering this (3) Piece set consisting of a Sugar Bowl, with Lid, and a Creamer. Both of which are Dainty and Feminine. These pieces are also Embossed and Scalloped.